The internet flooded with fake news and other trickery on April Fool’s day, but this announcement is no joke. 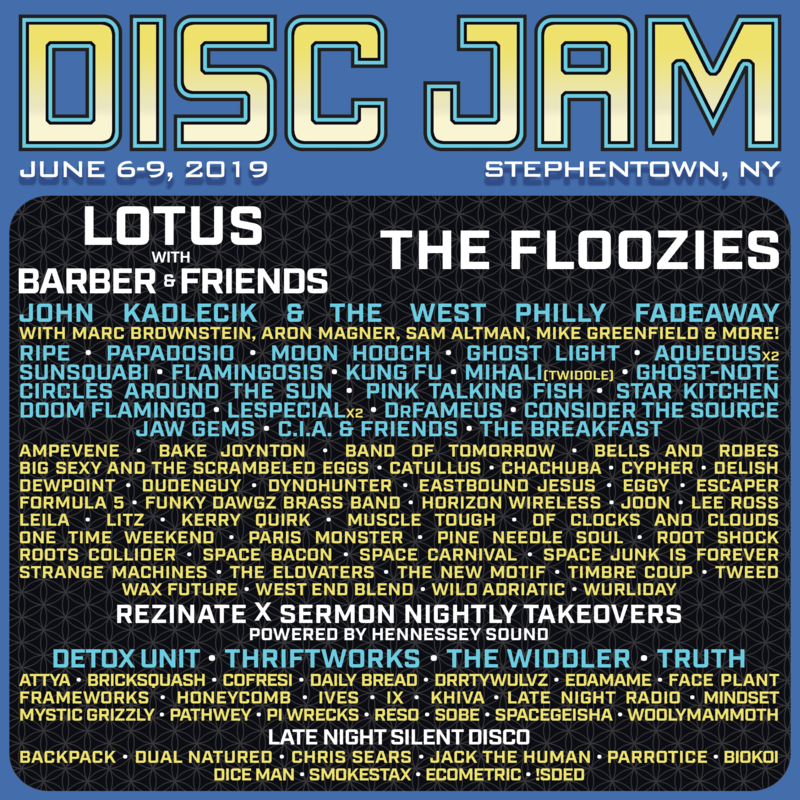 Disc Jam Music Festival released Phase Two of the 2019 lineup and it’s so good, it’s almost unbelievable. 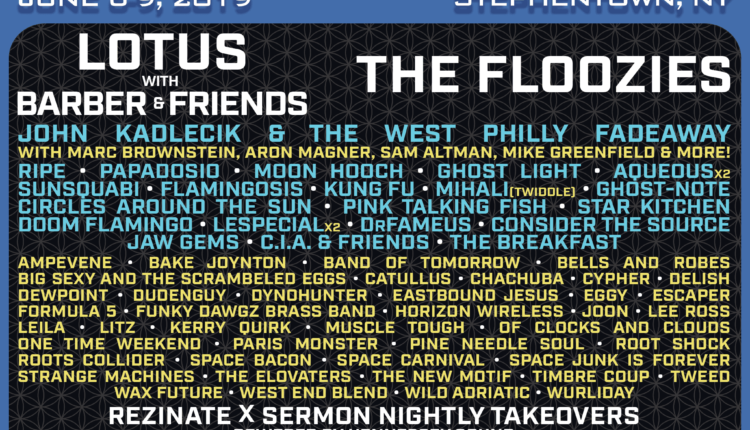 Joining the already jam-packed lineup will be Aqueous x2, SunSquabi, The Breakfast, C.I.A. & Friends, DrFameus and Flamingosis. Also included in Phase Two is an influx of artists to perform at the Woods Stage for nightly takeovers. 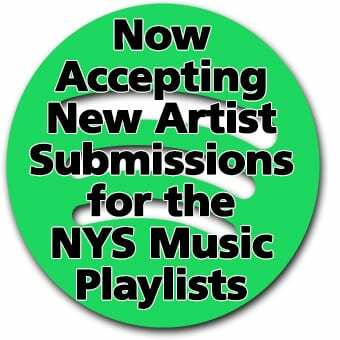 These artists are Detox Unit, Attya, Bricksquash, Cofresi, Daily Bread, Drrtywulvz, Edamame, Faceplant, Frameworks, Honeycomb, Ives, IX, Khiva, Late Night Radio, Mindset, Mystic Grizzly, Pathway, Pi Wrecks, Res, Some, Spacegeisha, and Woolymammoth. 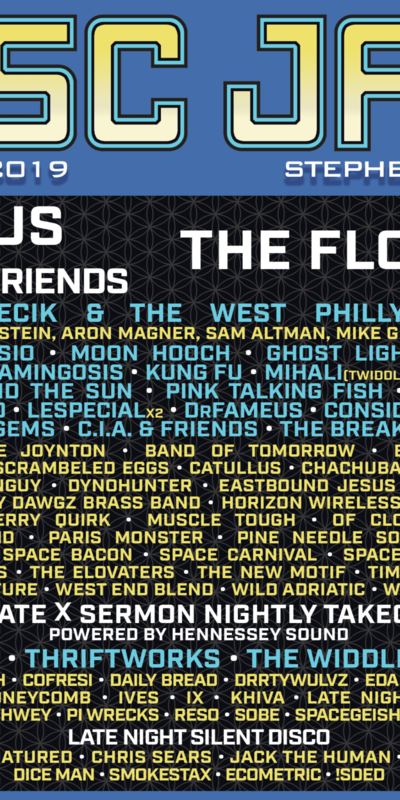 These Phase Two artists are uniting with previously announced Lotus with Barber of the Disco Biscuits & Friends, the Floozies, John Kadlecik & The West Philly Fadeaway (featuring Marc Brownstein, Aron Magner, Sam Altman of the Disco Biscuits, Mike Greenfield of Lotus and more,) performing the music of The Grateful Dead. Ripe, Papadosio, Moon Hooch, Ghost Light, Circles Around The Sun, Pink Talking Fish, Mihali (of Twiddle,) Doom Flamingo (featuring Ryan Stasik of Umphrey’s McGee,) Kung Fu, Lespecial x2, Ghost-Note, Star Kitchen with Marc Brownstein, Jaw Gems and Consider The Source. This lineup is bringing the best national touring acts, regional favorites and some really unique collaborations and side projects. 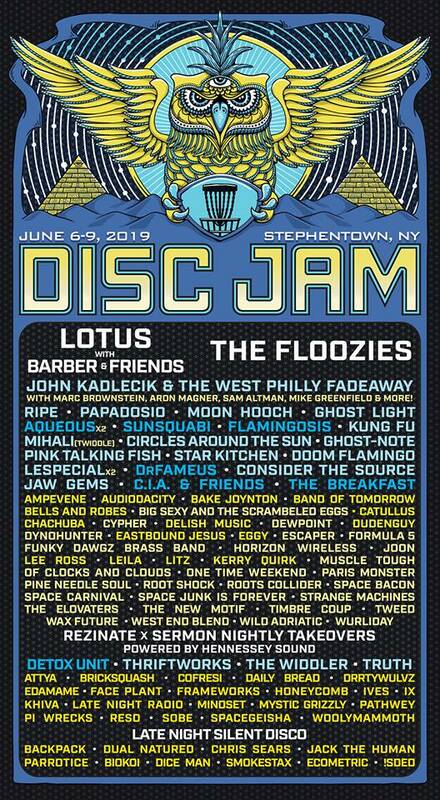 The 9th Annual Disc Jam Music Festival, held at Gardner’s Farm in Stephentown, NY is host to more than 50 live bands and 30 electronic artists, also disc golf tournaments, flow tribe performances, food and craft vending, yoga & wellness workshops over the weekend of June 6-9. Listen to the Disc Jam lineup on the Spotify Playlist. Tickets on sale now on the Disc Jam website. Check out the recap of last year’s sold out festival below!